My BFF declares she doesn’t want to go out to dinner with me anymore if small plates are involved. At first this feels like a stab to the heart. But I get it. Before I allow anyone to touch the food, I must snap pictures. This requires my fellow diners to exercise patience and willpower, particularly when multiple dishes are involved. BFF has many wonderful qualities, but even she will admit that patience isn’t her strong suit. Will the never-ending proliferation of small plates restaurants cause a rift in our friendship? I shudder at the thought. I have some of my own issues with small plates. Ordering en masse, sharing small bites of food… the results can be unsatisfying. It’s particularly awkward when you have odd numbers of people, and you try to split dishes into even portions. The small plates thing doesn’t seem to be going anywhere anytime soon, so the annoyances must be dealt with. So when two other friends want to meet for a weeknight dinner, I find myself suggesting Sugo Cichetti, the new Italian small plates restaurant in the blossoming Potomac Park development. Sugo Cichetti is brought to us by the owners of Cava, in partnership with the owners of Mamma Lucia. Hence the small plates meets Italian concept. I like Cava quite a bit (except for the fact that it’s usually unbearably loud). But another addition to the Rockville dining scene, which recently welcomed Founding Farmers, is fine with me. When I arrive one of my friends has already ordered cocktails. I can’t let her drink alone. 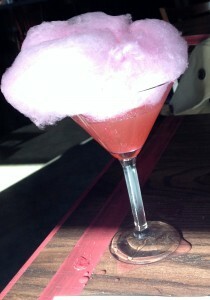 The server suggests “Sugo Magica” which is a cotton candy martini. Cotton candy conjures up happy memories of my childhood. What a wonderful way to bring the perfection of this delightful treat into the present day- add alcohol! I am a touch concerned that it will be too sweet, but this isn’t the case. It tastes quite good, and it’s great fun to watch the server pour alcohol over the cotton candy and watch it dissolve into the martini glass. There are a multitude of dishes that appeal to us from a menu that is divided into cold, cheese, charcuterie, Sugo balls, hot, Sugo sliders, pizza, and pasta. We make our decisions in no time. 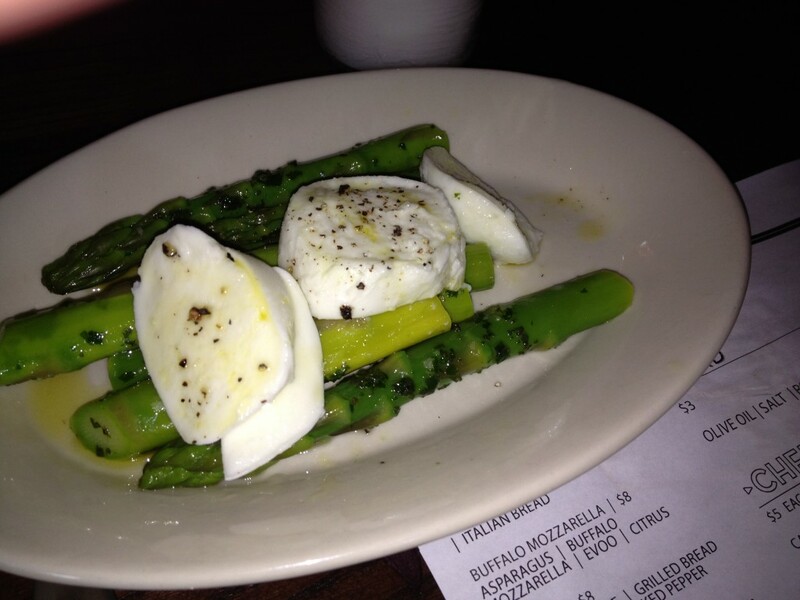 Buffalo mozzarella with asparagus and citrus is fresh and tasty. We’re off to a good start on a quick succession of dishes. Speaking of quick succession, this is another issue I have with small plates. The dishes come out at a fast and furious pace. We can’t keep up, so some of the dishes cool while we’re enjoying others. The solution is not too order everything at once, which is something I always remember when it’s too late. 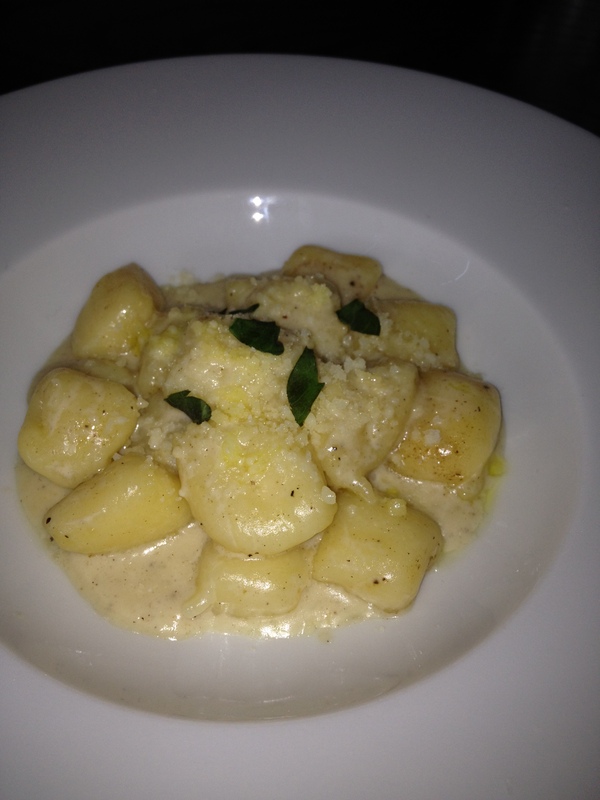 The gnocchi are a highlight, filled with cheese, truffle creme, and basil. They are light and fluffy, and the sauce is flavorful without being overwhelming. 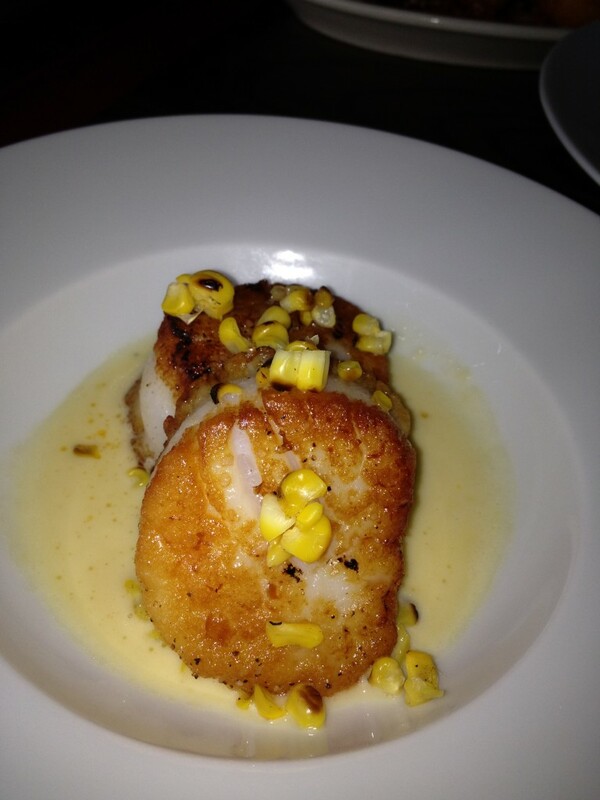 The seared scallops with smoky corn pancetta reduction is a dish I could easily enjoy as an entree. In fact, I yearn for a few more bites. But in the small plates world, there is no time to linger on one dish. The fried dishes are consistently light and airy, including a potato croquette. 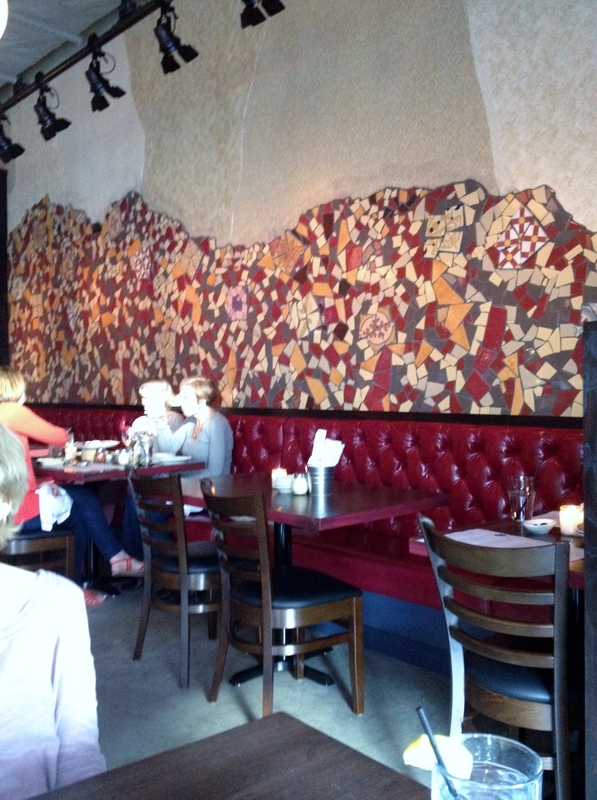 It’s not one of the more creative offerings on the menu, but it is well executed. 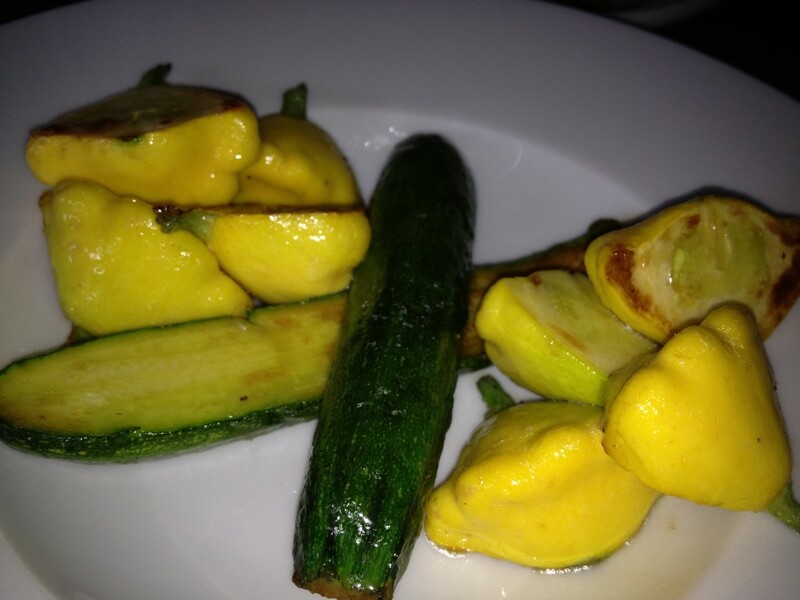 The zucchini squash with garlic and olive oil is also simple but tasty, athough I would easily switch it on a future visit for something different. 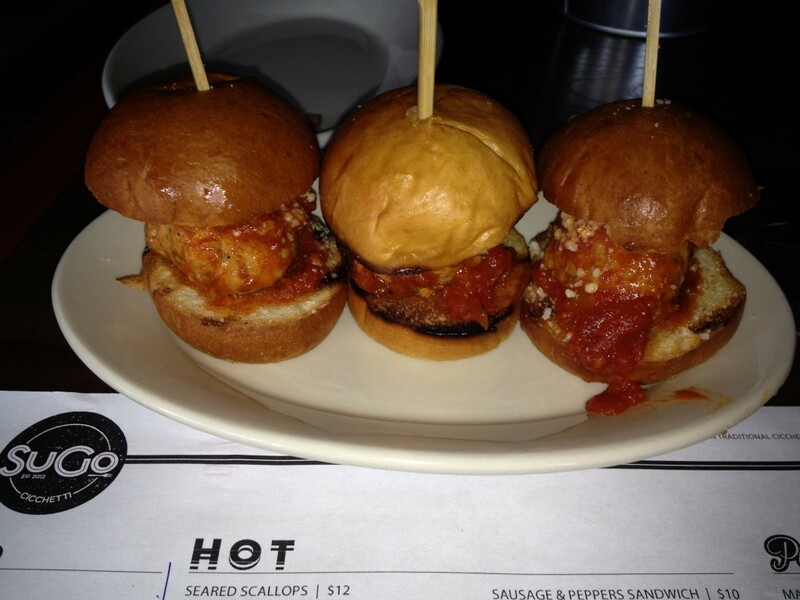 Sliders are available with chicken, veal, or spicy pork. We opt for spicy pork, which is nestled between some nicely toasted buns. And a plus, there’s one for each of us. I am picky when it comes to pizza. 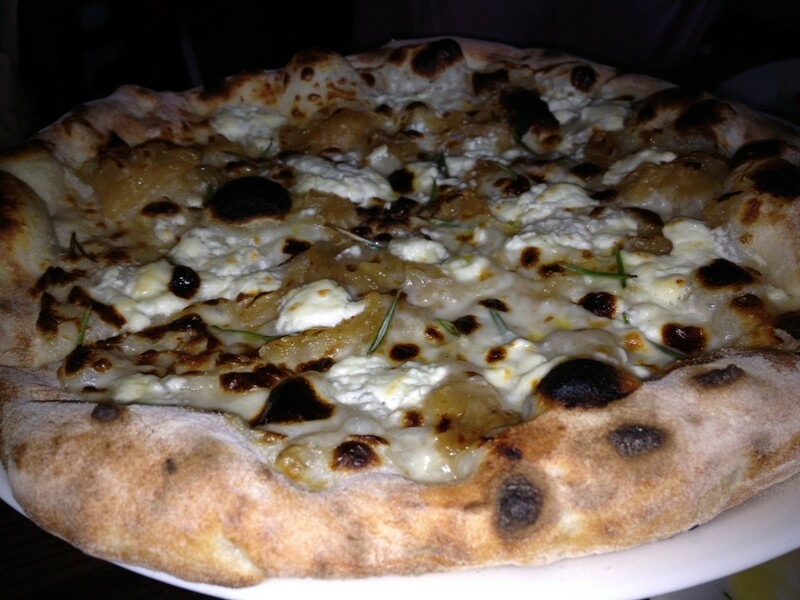 “Onion Love” with caramelized onions, shallots, goat cheese, and truffle oil is a combination of some of my all time favorite ingredients. The crust is nicely charred and perfectly crisped, which delights me. This pizza will definitely get me back to Sugo Cichetti sooner rather than later. A couple sitting next to us tells us that this is their second visit in a week. They tell us we must get the gelato, and we’re happy to oblige. One order comes with three flavors in miniature cones. It’s a cute little ending to the meal. The decor at Sugo Cichetti is fun- dark wood and very cool tiled wall, and those industrial ceilings that seem to be appearing everywhere these days. The good news is that the tables are spaced farther apart than they are at Cava Rockville, so conversation with the people across from you is possible. Although I can imagine that as Sugo Cichetti gains in popularity, as I’m sure it will, the sound level will rise as well. I phone BFF on the way home from dinner. I excitedly describe all the things I like about Sugo Cichetti. The food is quite good (oh, Onion Love), the location can’t be beat, the service is amiable, and the atmosphere is inviting. (I don’t dwell on the small plates part.) “When are we going?” she asks. I breathe a sigh of relief. Because really, Sugo Cichetti is just the kind of place you want to share with good friends.